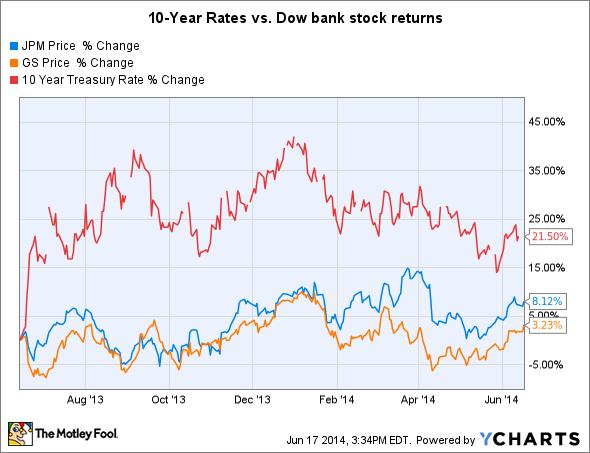 The relationship between interest rates and the banks in the Dow Jones Industrials is complex. The Dow Jones Industrials (DJINDICES:^DJI) finished higher 27 points higher Tuesday, largely due to the support of financial stocks. Goldman Sachs (NYSE:GS) led the Dow's banking gainers with a spike of nearly 1.5%, while JPMorgan Chase (NYSE:JPM) rose about 1% and banks outside the blue-chip index also gained ground. Many analysts attributed the rise in banking stocks to the boost in interest rates, but it's far from certain that higher rates will lead to rising share prices for Goldman Sachs, JPMorgan Chase, and their peers. The traditional banking model involves banks taking deposits in checking and savings accounts, which have short time horizons, and lending that money out at higher rates to longer-term borrowers. The bank profits from paying little or no interest on short-term demand accounts, maximizing its interest rate spread and thereby boosting its interest income. As a result, when long-term rates rise while short-term rates stay relatively stable -- as they did today -- banks can lend more profitably. Rate and stock data by YCharts. Bank stocks initially dropped after last summer's big rate hike, and then moved upward and downward even as rates trended higher throughout the remainder of 2013. This year, rates have fallen, but the short-term movements don't match up with daily rate fluctuations all that well. The other question for JPMorgan Chase and other traditional consumer banks is whether short-term rates will eventually rise just as much or even more than long-term rates. Today's report that the Consumer Price Index rose last month signaled a potential jump in price pressures, and that could prompt the Federal Reserve to take action sooner to control possible future inflation. If short-term rates rise, then deposit costs for JPMorgan Chase and its peers will also jump and could actually squeeze net interest income. Higher rates also threaten other sources of income, such as mortgage refinancing for JPMorgan Chase and bond underwriting for both Goldman Sachs and JPMorgan, that tend to climb when rates fall. Over the long run, interest rates play a key role for banking income. But don't make the mistake of assuming that daily moves in the Dow Jones Industrials' banking components are tied to daily rate fluctuations. Only once long-term rate trends establish themselves will it be clearer how banks will fare in the changing rate environment.